Mark Jones is currently serving his second term as Hays County Commissioner for Precinct 2, which includes the communities of Buda, portions of Kyle, Mountain City, the City of Hays, Neiderwald, and Uhland. As county commissioner, Mark has championed transportation improvements, including a major expansion of FM 1626 and moving State Highway 45 SW from a dream into reality. He also led improvements to traffic flow and driver safety on FM 967, FM 2001, IH-35 in Kyle, Dacy Lane, SH 21, and neighborhood roads throughout northern Hays County. A fiscal conservative, Mark has held the line on county taxes and spending, and maintained sensible and predictable regulations to promote economic growth throughout Hays County. By also making public safety a priority, Mark and his colleagues on the Commissioner's Court have helped to protect Hays County's reputation for low crime and high quality of life. Prior to his election as county commissioner, Mark was a two-term trustee and vice president of the Hays CISD School Board. In that capacity, he was responsible for leading one of Hays County’s largest employers and managing a budget in excess of $100 million. Under Mark’s leadership, the school district opened four new schools without ever raising taxes, and developed long-term plans for growth and improved student performance. Mark has also served on the Board of Directors for the Plum Creek Conservation District, a regional water district spanning two counties. Mark is married for more than three decades to Kerri, a public schools teacher. 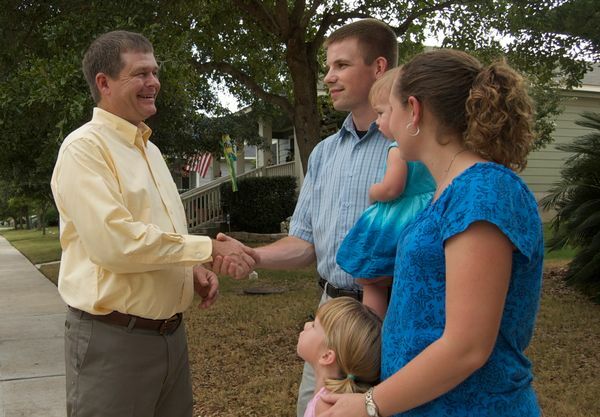 They have three grown children and attend First Baptist Church of Kyle, where Mark has served as a Deacon.